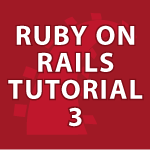 In this part of my Ruby on Rails tutorial, I cover how to create static pages, helper functions, shared layouts, how testing works and much more. A special emphasis will be paid to solving common errors with Rails. I’ll also show you how link_to works and how to use images. If you missed the previous parts check those out first. A transcript of the whole tutorial follows the video below. 1. When either page is called, code is executed in these methods and then the view is displayed. 2. Create tests that will secure your app, protect from known errors and protect code that is likely to change. 3. application.html.erb is the default layout used for every page. It puts what ever is in each page view between the body tags. We can use the value stored in the title symbol for each page with yield. "Put on Your Coat because Fall is here"